It’s a date with bourbon.., and a great opportunity to wear my grey suit and a new Akubra fedora! Well the invitation said it was to be a ‘premium male focused event’; so why not dress like one of the boys for a change?!!! As soon as Kent and I arrived at The Grain Bar, Four Seasons Hotel Sydney, we were offered and soon delighting in cocktails made with the Russell’s Reserve. While Kent went for the Russell’s Old Fashioned I started with the lighter Kentucky Iced Tea, both drinks of course made with the star of the evening – Russell’s 10 Year Old Bourbon; and we knew right away that we were in for a treat. The atmosphere was relaxing and social, we managed to catch up with our blogger friends and made some new friends; there were mini burgers, satay chicken and pizzas to keep us going, and of course more cocktails! At about the half way mark, Wild Turkey Master Distiller Jimmy Russell and his son Eddie took to the floor to talk to us about their latest creation; being in Australia (they love it) and the making of quality aged bourbon. I learnt that we are their biggest market outside the USA. Not only were we able to hear two legendary Master Distillers’ talk, we mingled with them and had our gift bottles of Russell’s Reserve signed by them as well!! As I stood in the queue for the signing, I admired how down to earth and patient these two marvellous men were with their guests; there was no sign of rushing, perhaps that’s the secret to why they are legends in the industry. Well after a few more glasses of Old Fashioned; Kent, who was also wearing his grey suit and fedora decided it was time to start introducing me to people as ‘mini me’! Mini him of course, well as if… But at least we seemed to be well suited to the event and we were truly honoured to meet Master Distillers Jimmy and Eddie Russell. Thanks to Trish Nicol Agency for the invite, we had a wonderful time! 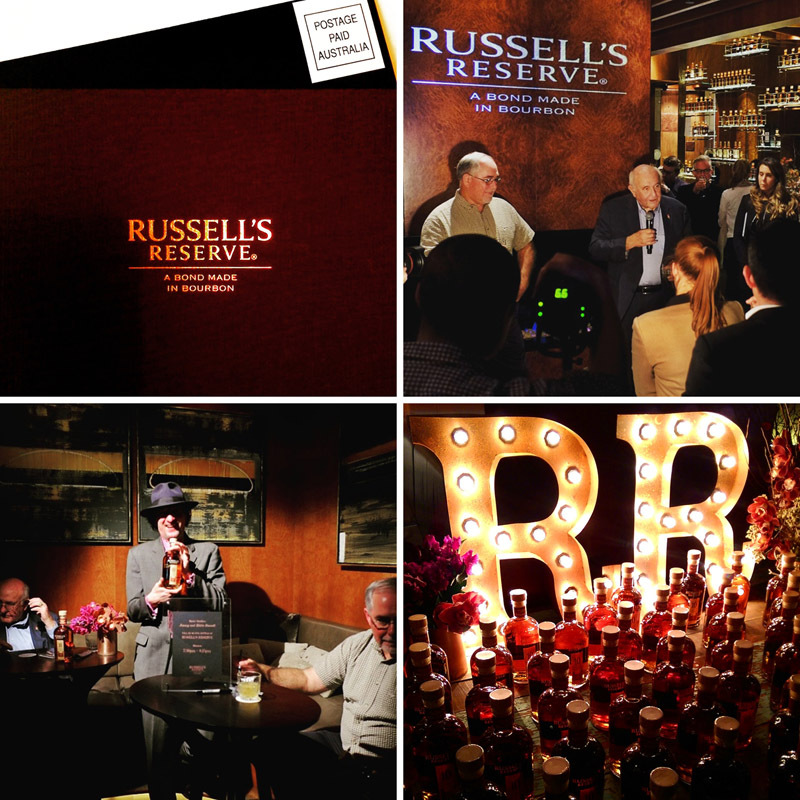 Russell’s Reserve Small Batch Bourbon Launch took place at Sydney’s Four Seasons Hotel. Hello Vivienne, it sounds like a good event.